When you're researching a wine fridge there are plenty of decisions that need to be made: freestanding or built in, small or large, removable racks or sliding shelves? Whether you're looking to start storing or collecting wine, or you're growing your cellar, Haier is definitely a brand to consider. Haier wine refrigerators come in a variety of sizes and styles and in both single and dual-zone models. We've taken the work out of researching wine coolers by providing you with comprehensive reviews of some of the top models Haier has. This is meant to give you a good starting point when thinking about your needs, budget, and what you want your cooler to look like. We've recommended 5 awesome Haier wine coolers and have made a handy "at a glance" chart reviewing the major features people look for in wine fridges. The selected models provide a good overview of what the brand offers and will also give you access to how people rate them and their general price. This chart summarizes the five Haier wine fridges, sharing highlights of what they have to offer. Below the chart you'll find more detailed reviews of these Haier models. What Do These Features Mean? If you're new to wine fridges the first thing you'll want to learn are what the main features are and which of these are most important for your wine storing needs. From bottle capacity to the types of shelving, let us demystify all those details. Will you need a wine cooler that can hold two cases? Or do you rarely have even a case in your home? Are you storing a long term collection or have quick turnover? One of the first things to think about is the number of standard wine bottles you need to hold. If you plan on having more wine in the house once you have the room, maybe add 8-10 to what you currently have but be honest when thinking about the number of bottles you want to keep on hand. Quick Tip: For those who drink wine regularly but don't collect, anything holding 18-30 bottles should work because once you have a wine fridge you'll automatically get more bottles. While you don't want to have to keep buying a larger capacity wine cooler you also don't want to cool an empty fridge. If you want to build a collection start at about a 30 bottle capacity. Another good idea is to track how much you drink and purchase and how many bottles are around your home (kitchen, pantry, fridge). There is a difference between thermoelectric and compressor-based cooling in wine fridges. Thermoelectric coolers are quieter and use less energy than compressor based coolers but cannot cool to as low a temperature and are not as resistant to ambient temperatures. Haier has some of the best ratings on thermoelectric wine coolers - something to think about if you end up going with this brand. Less sensitive to room temperatures, so more stable temp. Quick Tip: At Wine Turtle we prefer compressor-based wine fridges. Compressor based cooling is more stable and while it's louder than thermoelectric coolers, it's not noisy. For the investment, going with a cooler that will keep your temperature-sensitive wines at a stable temperature is a wise choice. Living in a small space and only drinking red? A thermoelectric wine cooler works fine, but for wines that need to get cooler and a constant temperature, a compressor based cooler is the best idea. Those who live in exceptionally warm climates should always select a wine cooler that has a compressor. 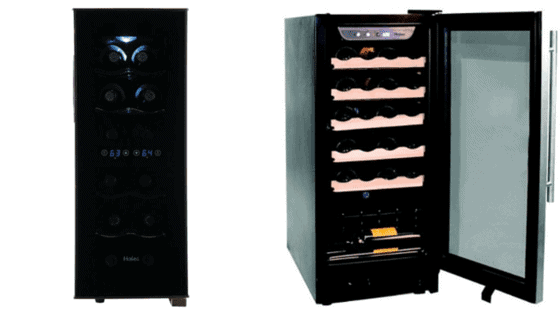 Wine coolers are available in single and dual zone models. Single zone wine coolers cool the entire fridge to the same temperature while dual zone wine fridges either have one or two doors and two areas for cooling - this allows you to store white and sparkling wine separate from red wine or to use the colder zone for juice, soda, liquor, and mixers. Quick Tip: We recommend a single zone wine cooler set to about 50 degrees. Just take reds out an hour to an hour and a half before you plan to drink it so it can warm up. If you are decanting you can use this time to allow it to sit in the decanter. 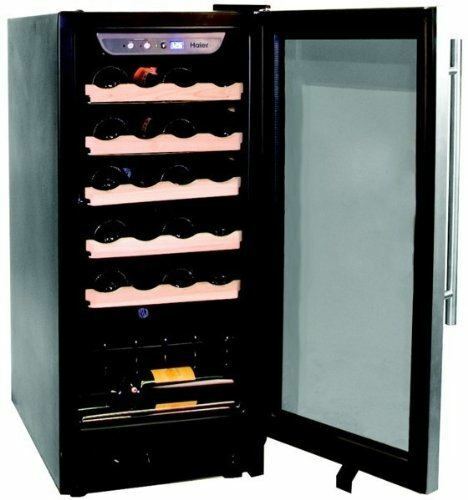 Wine fridges have glass doors, allowing you to view how many bottles you have. Some allow you to see the labels of bottles standing or lying flat parallel to the door. UV blocking glass keeps bottles and wine safer. The lighter the wine the more sensitive it is to light and heat so that is an excellent feature for those who keep a lot of Pinot Noir or white wine on hand. Haier is a subsidiary of a larger manufacturer that is headquartered in midtown Manhattan and makes a variety of appliances. In fact, they have the largest market share of home appliances. The company distributes world wide, adding North American distribution in the late 90's. Haier began in the 1920's in China and has had a complex history. They were taken over and run by the government before regaining autonomy and expanding. The company has a presence in India, Germany, throughout Asia and eventually set up a facility in the United States, originally in South Carolina. In the mid-1980's the founder discovered many issues with equipment and oversight and essentially revamped the company. 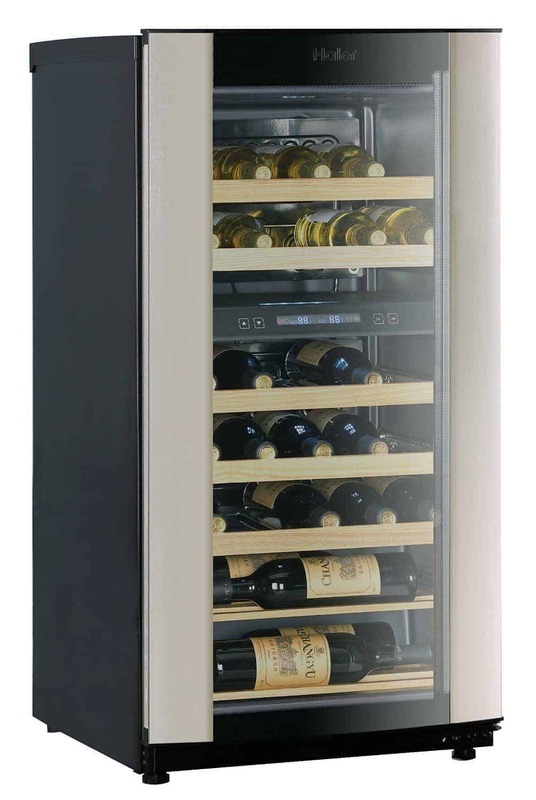 Haier wine coolers come in many different models with large and small capacities, freestanding and built in models, They include models with single and dual zones and a variety of shelving models including sliding shelves for easy access to larger wine collections. Summary: Haier provides a wide array of wine coolers ranging from lower to higher capacity that can fit any lifestyle: from smaller urban spaces to large wine rooms or cellars, whether you want it built in or standing free as the focal point of a room or in the background. Their coolers are fairly priced and many are high quality with rave reviews from customers. They have both quiet, thermoelectric wine coolers, and compression coolers -- so many choices for wine lovers of all different varieties. Compression Cooling - We prefer wine fridges that cool to lower temperatures and are able to keep those temperatures stable even in warmer ambient temperatures. Haier provides several quality options with compression cooling perfect for the wine lover who wants a higher capacity wine cooler or has wines that need to be temperature controlled. The Quality - There are several Haeir wine coolers with high ratings that including 20+ positive reviews. This is unusual in wine cooler reviews but there are consistently high rated offerings from Haier at a variety of bottle capacity, cooling mechanism and style. 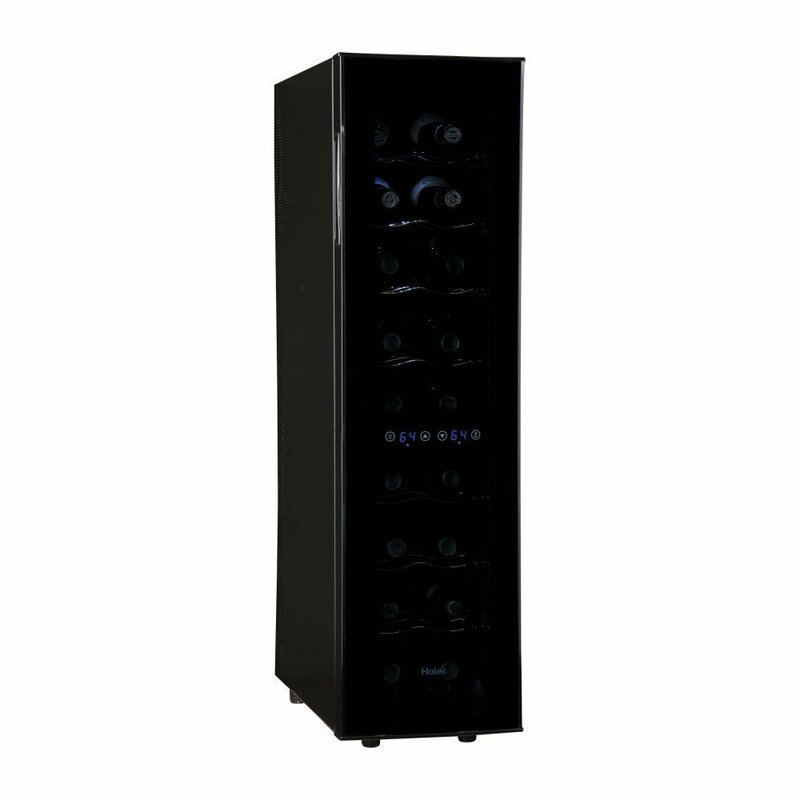 Choice - Whether it's 12 or 40 bottles you need to chill, whether you want to pop it into a cabinet space in your kitchen or place it as the focus of your wine room, there are lots of options of Haier wine refigerators. 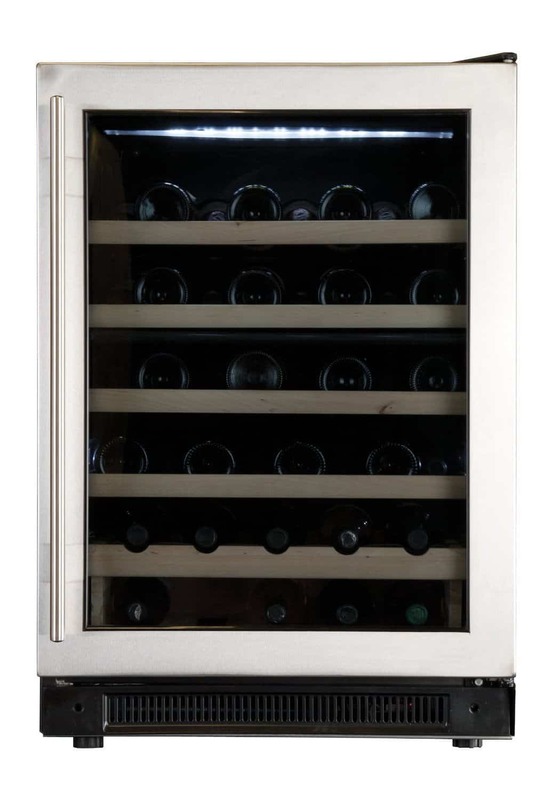 Wine lovers are likely to be able to find the exact cooler to fit their wine storage needs. Customer Service is a Mystery - Some reviewers love the service they get while others swear it's the worst they've received. The key is to always look in the middle, but even there we've still got a mystery. Consistently we found complaints of things taking far too long and also of receiving replacement parts or units that also didn't work. Bad Units - Besides the spotty customer service, there are repeat reports of units arriving damaged, malfunctioning shortly after being installed, and of replacements also malfunctioning. There are also reports of screws placed in the unit at an angle rather than straight. It appears that more recent units are better. Higher Capacity Units Have Problems - The lower capacity coolers get rave reviews but as the bottle capacity goes up, the quality of the coolers decline. The lower capacity coolers, however, have good reviews so they are a good choice for those looking for a good quality, highly reviewed, economical wine cooler choice. 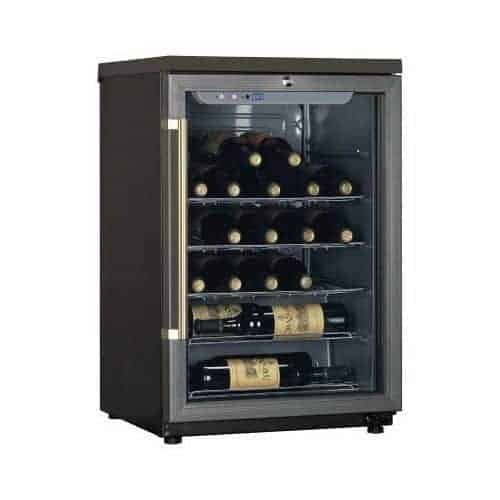 Haier provides a variety of large and small wine coolers with thermoelectric and compression cooling, freestanding and built in options, and single and dual zones. The high-rated models with multiple reviews are good and provide consumers with a positive wine cooling and storing experience. Some of their wine fridges have fewer reviews, but using a combination of what you're looking for, our snapshot of the brand and deeper look at Haier wine coolers chances are you can find a fridge that meets your needs.